The Chilean cat or Kodkod is the smallest wild cat of South America and rival the Black Footed Cat (Africa) and the Rusty Spotted Cat (Asia) as the smalles felins in the world. 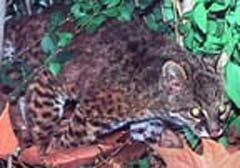 They are quite similar in appearance to Geoffroy’s Cat (Oncifelis Geoffoyi) with which they share their habitat, but they are smaller and do have a smaller face and thicker tail. Local people call them the Guigna, but there is no use of the name Kodkod though in Chile. It is thought to be an European reference. The basic color of the coat varies from light grey and grey brown to buff or dusky brown, marked with small, round black spots. Black on neck and crown with whitish underparts. The head is small with indistinct lines above the eyes and on the cheeks, and a white area around the eyes. The ears are relatively large and rounded, with blackish backsides marked with a white central spot. Their legs are short, and the foot pads fairly large with black soles. The tail is short, only about one third of the head-body length, and marked with black rings, and a black tip. Like the Andean mountain cat (Oreailurus jacobita), the tail of the Chilean cat is very bushy, growing wider towards the tip. Melanistic individuals are known to occur. There appear to be two distinctive forms. The race which occurs in central Chile is plain in coloration with no spots on their feet, and are larger than the race living in the southern part of their range. The southern animals are also more brightly colored and have spots on their feet. Found only in southwestern Argentina and central and southern Chile, these cats are strongly associated with moist temperate mixed forests of the Andean and Coastal ranges. They range up to the treeline at 1,900 to 2,500 metres. They are not tolerant of altered habitats, and are never found in cleared forests. 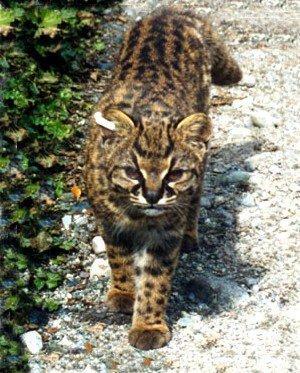 Some cover, such as trees or shrub areas is required for these little cats to survive. Chilean cats are only nocturnal in the presence of humans, and are active day and night if undisturbed. They usually live on the ground, although they have well developed climbing abilities, sheltering in the trees during the day and when pursued. Prey items are small mammals such as mice and rats, birds, insects and reptiles. One field study in the Kodkods preferred forest type found a high diversity of mouse sized rodents, but few larger mammals. In this heavily fragmented landscape, males must roam further and further to locate females, which brings them into contact with humans. 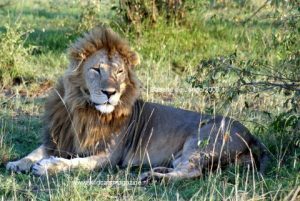 The first radio telemetry study on these cats found that females have small, localized territories and do not seem to range as far as the males. Females on Chiloe are averaging 1.7 kg, and the males 2.4 kg. Researchers have found that the local people believed this little cat was a vampire, sucking the blood of its prey. This error resulted from their finding two puncture marks on the neck of domestic poultry, which were actually the punctures from the cats canine teeth. By talking to the schools and local farmers, the researchers have done much to dispel this myth. Little is known of the Kodkods reproductive behavior. Gestation is thought to be 72 – 78 days, and one to three kittens are born. One female reached sexual maturity at 24 months. They have been known to live over 11 years in captivity but they have not been studied under captive conditions either. 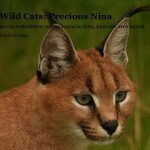 While there are currently no captive Kodkods in zoos, there is one private project in Chile attempting to breed these small felines, and has several cats at their facility. The population status in the wild is also unknown, but their very restricted geographical range probably means that there are a limited number of individuals. This makes Kodkods quite vulnerable to destruction of their forest habitat, something that is happening at far too rapid a pace all over South America. While their small size has saved them from being sought extensively for the fur trade, they are often caught in traps set out for foxes, and persecuted as poultry killers. They are nationally protected in both range countries, and there are several protected areas within their range in Argentina. CITES places them on Appendix II. Like other rare and elusive mammals, Kodkods may slip away entirely before we learn anything about their ecology and behaviour.